Founded three decades ago, Melissa & Doug have always been committed to making exceptional children’s products ever since the beginning. 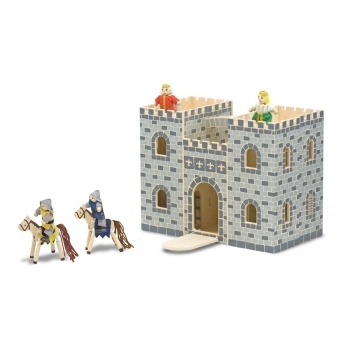 They offer a wide range from classic wooden toys to creative crafts for every age. 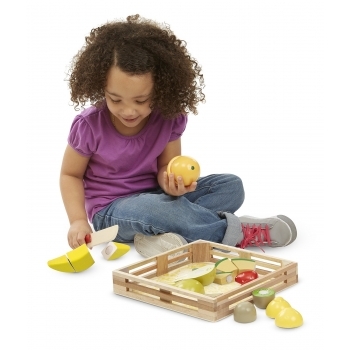 Educational, creative and meaningful products, that's what every toy needs to be. And while building their successful company which once started as a small family business for wooden toys, Melissa & Doug have raised a family of six kids... and every toy had to pass their uncompromising child testing before production began. Is your child mad about sirens and emergency vehicles? Then it will love this cool set of four sturdy wooden emergency vehicles. 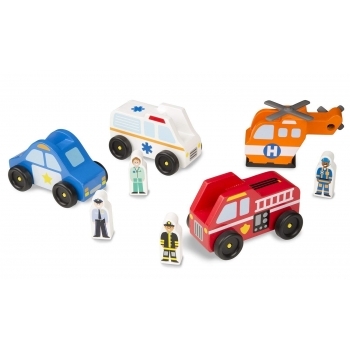 The toy car set includes a fire truck, a helicopter, a police car, an ambulance and the matching play figures as drivers and pilot. Great toy to promote imaginative play. Fairies, flowers and magical creatures. 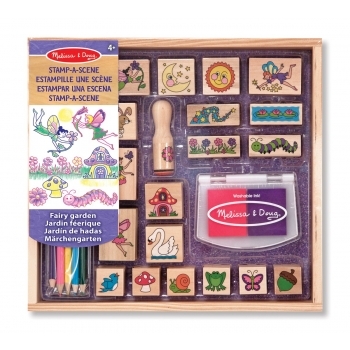 This wonderful Stamp-a-Scene Fairy Garden set has everything your kid needs to create a charming fairy themed picture. 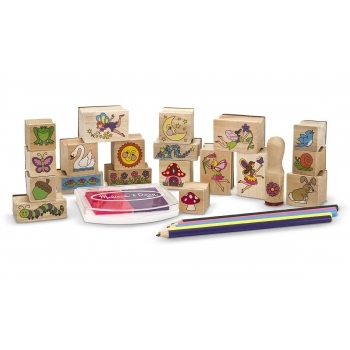 The set includes 20 rubber stamps with wooden handles, 5 colour pencils, a 2-colour stamp pad filled with pink and purple washable ink and a wooden tray to store everything in it. Why only chose one favourite animal when you can take the whole barn with you !? 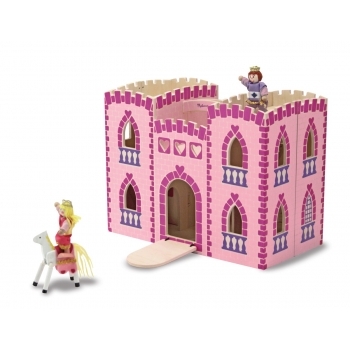 Melissa & Doug’s cute wooden Fold & Go barn can easily be transported from the kid’s room to the living room or for a sleep over at the grandparent’s. 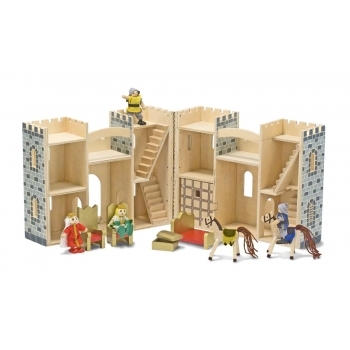 The whole set includes the wooden barn, seven plastic farm animals, a wooden ladder and a folding corral. This colourful latches activity board from Melissa & Doug helps your kid build its fine and gross motor skills by figuring out how the 6 different latches work. Your little one can snap, click, slide or hook the latches and discover a fun surprise behind each door or window and learn to count. The perfect play & learn toy. Where’s the little dog and what is in the big gift box ? 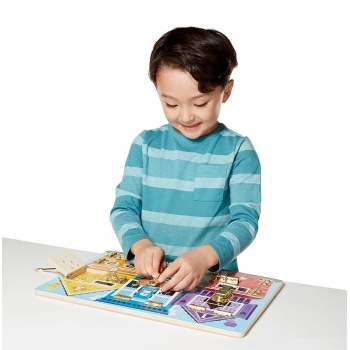 This lovely wooden hide & seek board will improve your kid’s memory and fine motor skills. Your little one will find one small magnetic piece behind each of the nine doors. 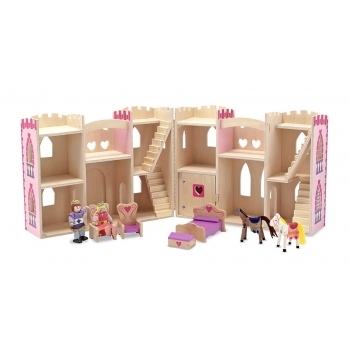 This lovely nesting set of 6 building with its matching vehicles lets children build their own little town, including a hospital, a fire station and a school. 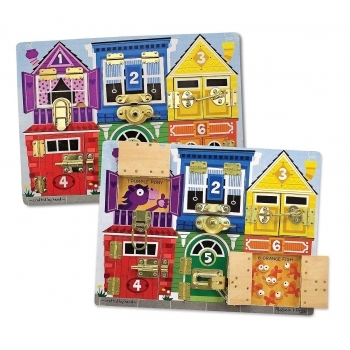 Matching colours, or pairing numbers of the buildings and the vehicles, reinforce early-learning concepts as they play. 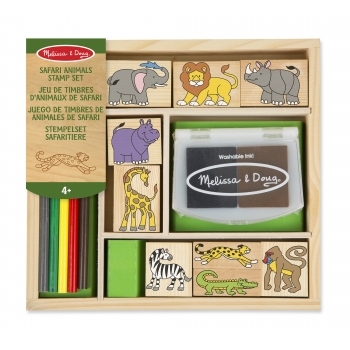 Go wild with Melissa & Doug’s Safari Animal Rescue Truck. The wooden toy truck includes two wooden safari rangers and seven animals to be rescued. Lift the cargo door and unload the animals. This set promises hours of creative imaginary play. 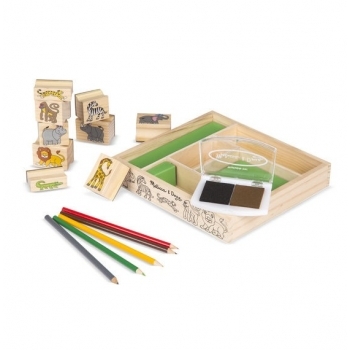 Let your child’s imagination go ‚wild’ with This lovely Stamp-a-Scene Safari set. The set includes 9 rubber stamps with wooden handles, 5 colour pencils, a 2-colour stamp pad filled with blue and brown washable ink and a wooden tray to store everything in it. 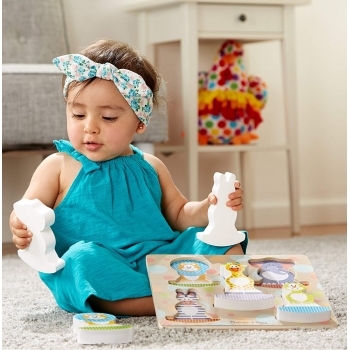 This lovely Safari Chunky Puzzle from Melissa & Doug is the perfect gift for small little hands. The 5 wooden puzzle pieces have curved bases so that they stand up and rock. And your little one can find matching pictures of the animals under each piece, so that they learn to put the right animal onto the right shape. How about a delicious Birthday Cake all year long ? This cool wooden set includes 6 ready-to-cut slices of cake, removable candles and toppings, a cake plate and server, all packed up in a box to store away. Velcro tabs hold the cake and its candles and toppings together. How about some tasty fruits ? 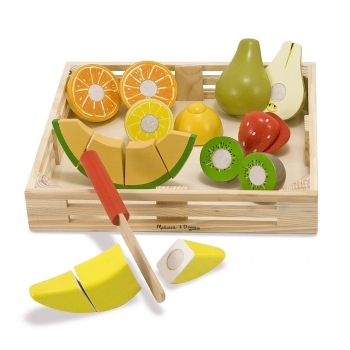 This lovely wooden fruit set contains 7 different fruits that can be cut into 17 pieces, a wooden toy-knife and a large wooden box to store all the fruits in it. Velcro tabs hold the fruits together. A classic set for every toy kitchen. Ding Dong! Four little wooden dolls are hiding behind each door and every door has a doorbell, a unique lock and a matching key to open it. The keys attached to the house so they won’t get lost and the handle allows your kids to take the cool doorbell house everywhere they go.